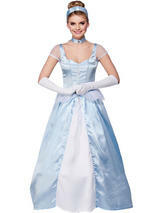 Cinderella was released in 1950 and is one of many of Disney’s animated musicals. Cinderella’s cruel Step Mother and Step Sisters attempt to prevent her attending a ball set up for the Royal Prince Charming to find his Princess. At the point of giving up, her Fairy Godmother appears with a spell to dress her in a long shimmering blue dress, glass slippers and turns a pumpkin into a carriage, the one catch being that the spell will break by midnight. 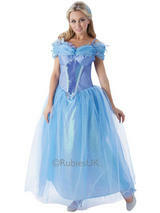 At the stroke of midnight, after meeting Prince Charming, she flees, leaving a glass slipper behind. 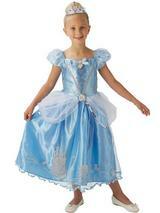 The rest of the story is about the Prince trying to find the girl who fits the glass slipper. 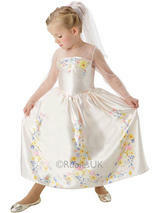 We have beautifully made Cinderella Princess dresses and accessories here, and your little Princess will go to the ball!